Click and Go Table of Contents: Left Pane Explorer-like icons enable you to instantly go to any section of this Title or any other installed Synapse Chemlib product. The purpose of lubrication is to reduce friction and/or wear. Lubricant chemicals are an integral part of the processing and formulation of both industrial and consumer products and span a diverse set of applications from their use in heavy equipment and fuels through their addition to food, cosmetic, and pharmaceutical products. In heavy industry, the critical factors in lubrication are: mitigation of wear and improvement of mechanical efficiency through friction and heat reduction. Manufacturers of the lubricant component in formulations for the cosmetic, food, dental, and pharmaceutical industries need to consider health, safety, and organoleptic (odor, feel, taste, color) factors in choosing the most effective lubricant chemical for their formulations. Thus, the selection of the lubricant component is dependent on: the specifications of the application, the chemical nature of the lubricant, and its synergy with the functional additives that are a part of the end formulation.. This reference describes over 8000 trade name and generic chemicals and materials used to provide lubricating effects in application areas that include: agriculture, automotive, aviation, cosmetics, dental products, food and food processing, heavy equipment, fuel additives, metalworking, mining, marine, paints/coatings, pharmaceuticals, plastics/elastomers, pulp/paper, textiles. 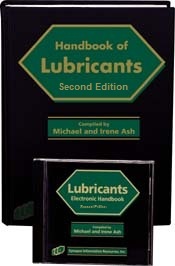 Both The Handbook of Lubricants-Second Edition and the software version are designed to function as selection tools for deciding which is the most appropriate lubricant chemical to use in a formulation. A wide variety of lubricant types are included: petroleum lubricants (based on hydrocarbon products), synthetic lubricants (based on silicones, phosphate esters, silicate esters, polyglycol ether compounds, fluoral compounds, etc. ), liquid oily lubricants (based on animal and vegetable products) and solid lubricants (based on metals, organic, and inorganic compounds). This reference centralizes information on these currently available chemicals and materials from major manufacturers by profiling both trade name and generic chemicals, detailing their properties, uses, use levels, regulatory status, toxicology, sources for purchase, etc. Trade Name Reference provides an alphabetical listing on more than 6000 trade name chemicals and materials that are used in formulations requiring lubrication as a key or ancillary function. Each entry includes the manufacturer's name; chemical/material description; its detailed functions and applications in all aspects of industry; physical properties, such as form, molecular weight, density, solubility, boiling point, cloud point, flash point, pH, freezing point, activity; toxicology, storage, precautions, etc. Keyword Indexes: Comprehensive Index, Trade Name X-Ref, Generic Chemical X-Ref, Manufacturers X-Ref, CAS X-Ref, EINECS/ELINCS X-Ref, Functional/Applications X-Ref. Covers more than 2000 chemicals and materials that are contained in the trade name products profiled in Part I or generic chemicals that are not linked to trade names but are used in these lubricating formulations. Each entry contains information including the following: CAS (Chemical Abstract Service), EINECS/ELINCS (European Inventory of Existing Commercial Chemical Substances/European List of Notified Chemical Substances), and UN/DOT reference numbers, classification, definition, chemical synonyms, empirical and molecular formulas, properties, toxicology, precautions, storage, uses, use level, regulatory details, manufacturers and distributors. All chemical/material synonyms are cross-referenced back to the main entry. These entries/ are followed by a listing of the trade name products that are either equivalent to the monograph entry or contain it as one or more of its ingredients. Keyword Indexes: Comprehensive Index, Trade Name X-Ref, Generic Chemical X-Ref, Manufacturers X-Ref, CAS X-Ref, EINECS/ELINCS X-Ref, Functional/Applications X-Ref., Molecular Formula Dir. A powerful tool for locating the trade names and chemicals based on their function and/or industrial application area. By searching for key functional words related to lubrication such as antiseize compound, compressor oil, coning oil, EP additive, lubricant, release agent, or specific application areas such as coatings, PVC processing, refrigeration, fuels, tableting, topical pharmaceuticals, creams and lotions, etc., the user is directed to the trade names and/or chemicals that have that specific functional/application attribute. The generic component names are distinguished from the trade names by italic type. Detailed contact information for the more than 3,300 worldwide manufacturers and their branches of trade name products and chemical components that are referenced in this handbook. Wherever possible, telephone, telefax, toll-free numbers, e-mail and internet addresses, and complete mailing addresses are included for each manufacturer. CAS Number Index contains CAS number entries followed by a listing of their trade name product and chemical equivalents in alphabetical order. The chemical name is in boldfaced type. EINECS/ELINCS Number Index contains EINECS/ELINCS number entries followed by a listing of their trade name product and generic chemical equivalents in alphabetical order. The chemical name is in boldfaced type. Glossary contains definitions of terminology associated with lubricants and their application areas.